Oil States’ Lynx connection, in operation since the 1990’s, is a weight-set, non-rotational connection that has been field proven worldwide on platform, semi-submersible, jack-up and drillship applications. The unique design ensures easy stabbing with visual and easy dimensional verification of makeup, allowing complete confidence in correct assembly. 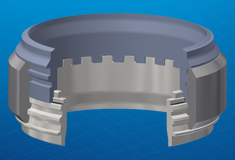 No tooling is required, and the connection is fully reversible with options ranging from 20″ through to 42″. See Lynx™ HD connector animation here. See Lynx™ SA2 connector animation here. Easy visual and dimensional proof of makeup. Remote release option available for mud-line applications. No tooling or personnel required for makeup.